Argentine ant (Linepithema humile) workers are monomorphic, displaying no physical differentiation (Holway et al. 2002a). 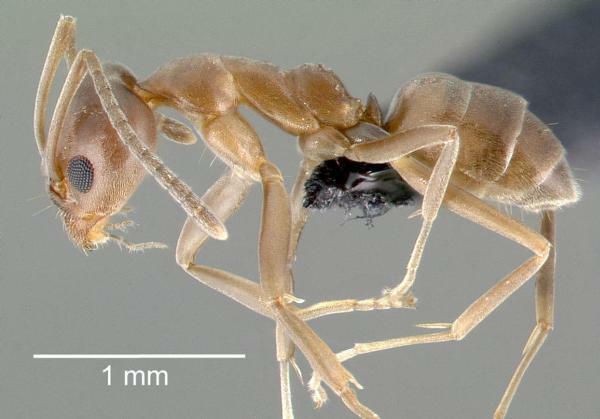 The workers of this species are small, medium to dark brown ants, reaching 2 to 3mm in length. Body surface is smooth and shiny and lacks hairs on the dorsum of the head and thorax. The petiole is composed of a single, scale-like segment, and sting is absent. Workers are extremely fast moving and industrious, often recruiting in high numbers. Please click on AntWeb: Linepithema humile for more images and assistance with identification. The AntWeb image comparison tool lets you compare images of ants at the subfamily, genus, species or specimen level. You may also specify which types of images you would like to comare: head, profile, dorsal, or label. 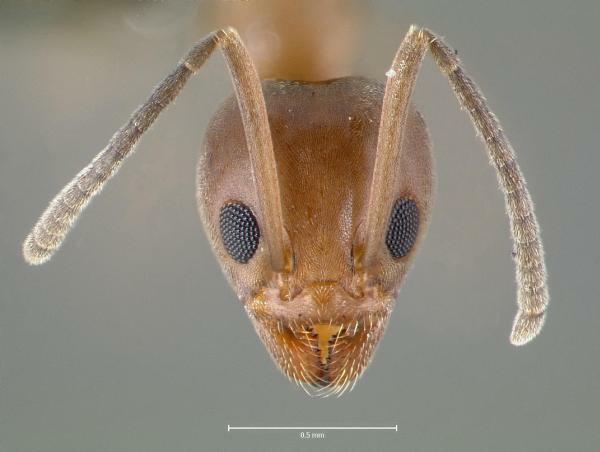 Please see PaDIL (Pests and Diseases Image Library) Species Content Page Ants: Argentine ant for high quality diagnostic and overview images. The change in the structure of Argentine ant (Linepithema humile) colonies in introduced populations (i.e. in non-native regions) is due to the genetic makeup of such colonies (Tsutsui et al. 2000; Tsutsui and Suarez 2003). These “uniclonal” colonies consist of workers that lack internest aggression, allowing workers to co-operate together as one supercolony, optimising foraging range and efficiency. This trait is greatly advantageous and allows ant colonies to attain high local densities and dominate ecosystems rapidly (McGlynn 1999; Holway et al. 2002a; Ness and Bronstein 2004). The mechanisms required for workers to recognise workers from a different colony are believed to be dependant on genetic mechanisms (i.e. differences). Researchers believe that because introduced populations have a lower level of genetic diversity compared with parent populations (due to having experienced a “population bottle-neck”) there is insufficient genetic diversity between workers for ants to be able to recognise workers as belonging to a different colony (Tsutsui et al. 2000). It has been suggested that the introduction of new alleles into introduced populations could increase genetic differentiation sufficient to trigger intraspecific aggression (which would alter colony structure, leading to a decrease in ant densities). On the other hand, populations with low levels of genetic diversity have underlying inherent traits that reduce adaptive ability in the long run and this control method may prevent the natural break-down of uniclonal colonies over time (Tsutsui et al. 2000). Virgin queens are believed to mate in the nest and disperse through budding rather than participating in a nuptial flight, resulting in the formation of large, many-queened, cooperating unicolonies (Markin, 1968). Queens may be killed by workers after one year and replaced by newly mated queens (Markin, 1970; Keller et al., 1989). Some abiotic factors are known to potentially regulate Argentine ant invasiveness; in Australia the large biodiversity of the ant genus Iridomyrmex confers a certain level of natural resistance to some habitats (Majer 1994, Andersen 1997, and Hoffmann et al. 1999, in Holway et al. 2002a). Humans predispose habitats to Argentine ant invasion as they create mesic habitats within arid zones through the modification of land. For example, in San Diego, runoff resulting from irrigation and human dwellings increases natural runoff by more than four-fold (Holway 2002b). This forms habitats more suitable to Argentine ant colonisation, indirectly opening up environments to ant invasions. A study by Suarez, Bolger, and Case (1998), conducted in California, showed the Argentine ant to be more abundant near developed areas. Sexual, haplodiploid system. 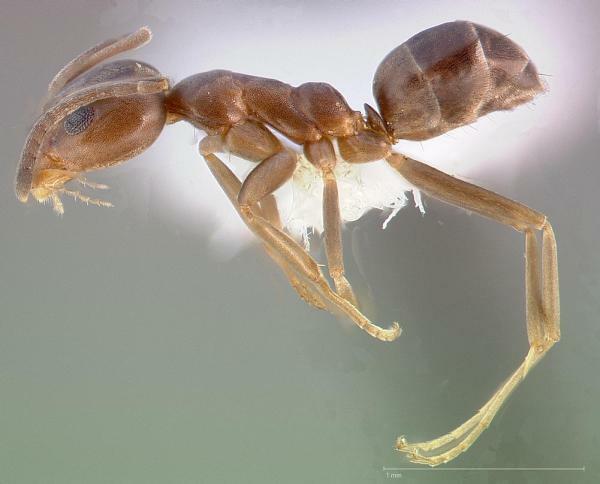 Although the workers of all invasive ants are sterile, the Argentine ant (Linepithema humile) can rear eggs and early instar larvae into sexuals in the absence of queens. It is not known whether orphaned colonies of other invasive ants are able to develop into reproductive viable colonies despite the absence of a queen (Holway et al. 2002a). In Argentina, the Argentine ant (Linepithema humile) is commonly referred to as the sugar ant: a fitting name given its preference for sweet substances (Newell and Barber 1913, in Holway et al. 2002a). In line with this observation, baiting trials suggest that L. humile considers carbohydrate-rich resources such as honey or water equally, if not more attractive than protein-rich resources (Ness and Bronstein 2004). However, the ant has an overall generalised diet (similar to other invasive ants), including nectar, insects, carrion and honeydew secreted by Homopteran insects (Woodworth 1908, Horton 1918, Mallis 1942, Flanders 1943, Creighton 1950, Markin 1970a, in Suarez Bolger and Case 1998). Argentine ants were commonly found in cargo coming from California in the early part of the 20th century (Zimmerman 1941, in Earlham College 2002). For example, early this century it was noted that nearly every one of over 100 steamships landing between New Orleans and Baton Rouge, Louisiana, was heavily invested with Argentine ants (Newell and Barber 1913, Barber 1916, in Suarez Holway and Case 2001).Nest fragments may be moved by transport vehicles. Colony establishment may be achieved by relatively small propagules, with as little as a single queen and 10 workers required for the establishment of a new colony (Hee et al. 2000).Argentine ants were brought to Hawaii with troops in the Second World War (Passera 1990, in Earlham College 2002). Review: Paul Krushelnycky, University of California at Berkeley; Andrew Suarez, University of California at Berkeley. Recommended citation: Global Invasive Species Database (2019) Species profile: Linepithema humile. Downloaded from http://www.iucngisd.org/gisd/speciesname/Linepithema+humile on 21-04-2019. Preventative measures: The Pacific Ant Prevention Programme is a proposal prepared for the Pacific Plant Protection Organisation and Regional Technical Meeting for Plant Protection. The plan aims to prevent the red imported fire ant and other invasive ant species with economic, environmental or social impacts from establishing within, or spreading between, countries in the Pacific. Please see Linepithema humile information sheet, prepared as part of 'The invasive ant risk assessment project', Harris et al. 2005., for Biosecurity New Zealand by Landcare Research. Hartley et al. (2006) modelled the potential future range of the Argentine ant. They found that it is most likely to occur where the mean daily temperature in mid-winter is 7-14°C and maximum daily temperatures during the hottest month average 19-30°C. Uninvaded regions considered vulnerable to future establishment include: southern China, Taiwan, Zimbabwe, central Madagascar, Morocco, high-elevation Ethiopia, Yemen and a number of oceanic islands. Please follow this link for more detailed information on the management of the Argentine ant Linepithema humile compiled by the ISSG. Informations on Linepithema humile has been recorded for the following locations. Click on the name for additional informations. Forschler, B. T. and Evans, G. M. 1994. Argentine ant (Hymenoptera: Formicidae) foraging activity response to selected containerized baits. J. Entomol. Sci. 29(2): 209-214. Summary: Found that baits formulated with hydramethylnon or sulfluramid were effective in eliminating foraging ants in an urban setting. Green, C. 2005. Argentine ant update, Dawn Chorus 60: 8. Supporters of Tiritiri Matangi. Haney, P. 1984. A different approach to the Argentine ant problem. Citrograph 69(6): 140-146. Summary: Provides a brief review of historical chemical approaches to Argentine ant control in agriculture, and presents results for liquid Diazinon and Lorsban spray treatments of citrus trees. Harris, R. J. 2002. Potential impact of the Argentine ant (Linepithema humile) in New Zealand and options for its control. Science for Conservation 196. 36 pp. Hartley, Stephen, Harris, Richard & Lester, Philip J., 2006. Quantifying uncertainty in the potential distribution of an invasive species: climate and the Argentine ant. Ecology Letters 9 (9), 1068-1079. Hawaiian Ecosystems at Risk (HEAR) Project. 2005. Haleakala Field Station. U.S. Geological Survey (Biological Resources Division /Pacific Island Ecosystems Research Center). Holway, D.A., Lach, L., Suarez, A.V., Tsutsui, N.D. and Case, T.J. 2002a. The Causes and Consequences of Ant Invasions, Annu. Rev. Ecol. Syst. 33: 181-233. Hooper-Bui, L. and Rust, M. K. 2000. Oral toxicity of abamectin, boric acid, fipronil, and hydramethylnon to laboratory colonies of Argentine ants (Hymenoptera: Formicidae). Economic Entomology 93(3): 858-864. 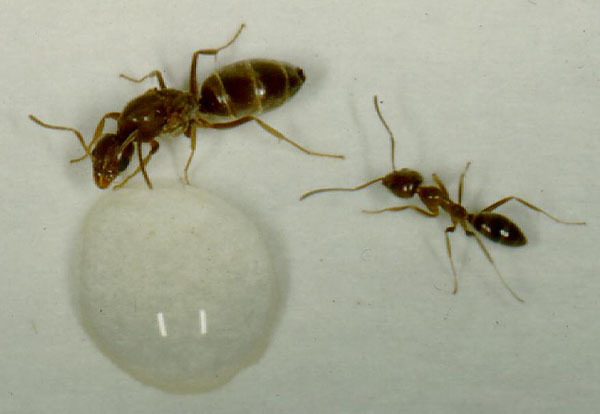 Summary: Conducted laboratory tests of the effectiveness of four toxicants against the Argentine ant. Hooper, L. M. 1995. The biology of the Southern Fire Ant, Solenopsis xyloni (McCook) and its predation of the California Least Tern, Sterna antillarum browni (Mearns). MSc Thesis, University of California Riverside. Summary: Masters thesis dealing primarily with Solenopsis xyloni, but also makes some references to Linepithema humile. Krushelnycky, P. D. and Joe, S. M. 1997. 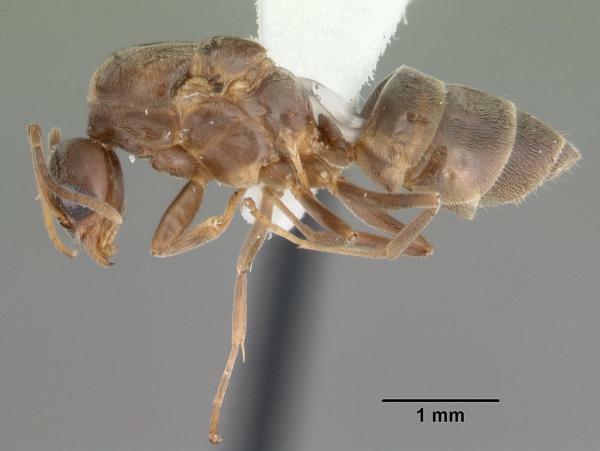 Harmful Non-Indigenous Species report on Argentine ant. Hawaiian Ecosystems at Risk website. Summary: Provides a brief review of Argentine ant control efforts, particularly work at Haleakala National Park in Hawaii prior to 1997. Krushelnycky, P. D. and Reimer, N. J. 1998. Bait preference by the Argentine ant (Hymenoptera: Formicidae) in Haleakala National Park, Maui, Hawaii. Environmental Entomology 27: 1482-1487. Summary: A year-long study determining the seasonal preferences of baits that could potentially be used in control efforts. Krushelnycky, P. D. and Reimer, N. J. 1998. Efficacy of Maxforce bait for control of the Argentine ant (Hymenoptera: Formicidae) in Haleakala National Park, Maui, Hawaii. Environmental Entomology 27: 1473-1481. Summary: An initial attempt to eradicate Argentine ants from test plots in Haleakala National Park, using standard Maxforce bait as well as new bait varieties formulated with hydramethylnon. Was unsuccessful in achieving eradication. Krushelnycky, P. D.; E. Van Gelder, L. L. Loope, and R. Gillespie., 2002. The status of invasive ant control in the conservation of island systems. In Turning the tide: the eradication of invasive species: 406 - 414. IUCN SSC Invasive Species Specialist Group. IUCN. Gland. Switzerland and Cambridge. UK. Krushelnycky, P.D., Loope, L.L. and Joe, S.M. 2004. Limiting spread of a unicolonial invasive insect and characterization of seasonal patterns of range expansion, Biological Invasions 6: 47�57. Tsutsui, N.D. and Suarez, A.V. 2003. The Colony Structure and Population Biology of Invasive Ants, Conservation Biology 17(1): 48-58.
van Schagen, J. J., Davis, P. R. and Widner, M. A. 1994. Ant pests of Western Australia, with particular reference to the Argentine ant (Linepithema humile). In Williams, D. F. (ed.) Exotic Ants: Biology, Impact and Control of Introduced Species: 174-180. Summary: Reports on effort to eradicate the Argentine ant in Western Australia. Walker, K. 2006. Argentine ant (Linepithema humile) Pest and Diseases Image Library. Updated on 29/08/2006 12:06:40 PM. Benois, A. 1973. Incidence des facteurs ecologiques sur le cycle annuel et l activite saisonniere de la fourmi d Argentine, Iridomyrmex humilis Mayr (Hymenoptera, Formicidae), dans la region d Antibes. Insectes Sociaux, 20: 267-296. Bond, W. and Slingsby, P. 1984. Collapse of an ant-plant mutualism: the Argentine ant (Iridomyrmex humilis) and myrmecochorous proteaceae. Ecology 65(4): 1031-1037. Summary: Found that the exclusion of native ants by Argentine ants led to decreased rates of seed dispersal in plants adapted to ant-mediated seed dispersal. Cammell, M. E., Way, M. J. and Paiva, M. R. 1996. Diversity and structure of ant communities associated with oak, pine, eucalyptus and arable habitats in Portugal. Insectes Sociaux, 43: 37-46. Carney, S.E., Byerley, M.B. and Holway, D.A. 2003. 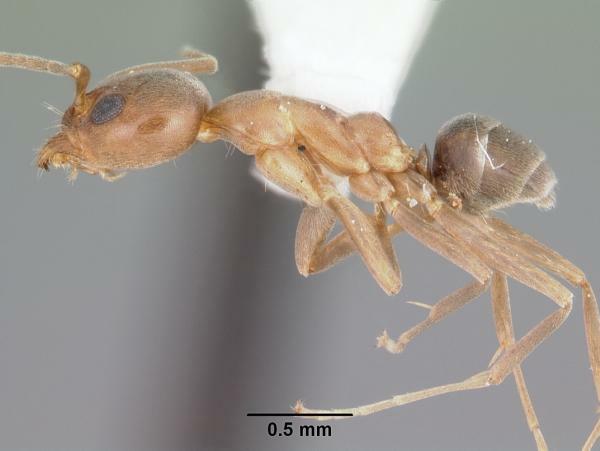 Invasive Argentine ants (Linepithema humile) do not replace native ants as seed dispersers of Dendromecon rigida (Papaveraceae) in California, USA, Oecologia 135: 576�582. Carpintero, S., Reyes-L�pez, J. and Arias de Reyna, L. 2005. Impact of Argentine Ants (Linepithema humile) on an arboreal ant community in Do�ana National Park, Spain, Biodiversity and Conservation 14: 151-163. Christian, C. E. 2001. Consequences of a biological invasion reveal the importance of mutualism for plant communities. Nature 413: 635-639. Cole, F. R., Medeiros, A. C., Loope, L. L. and Zuehlke, W. W. 1992. Effects of the Argentine ant on arthropod fauna of Hawaiian high-elevation shrubland. Ecology 73(4): 1313-1322. CONABIO. 2008. Sistema de informaci�n sobre especies invasoras en M�xico. Especies invasoras - Insectos. Comisi�n Nacional para el Conocimiento y Uso de la Biodiversidad. Fecha de acceso. Holway, D. A. 1995. Distribution of the Argentine ant (Linepithema humile) in northern California. Conservation Biology 9: 1634-1637. Holway, D. A. 1998. Effect of Argentine ant invasions on ground-dwelling arthropods in northern California riparian woodlands. Oecologia 116: 252-258. Holway, D. A., L. Lach, A. V. Suarez, N. D. Tsutsui, and T. J. Case. 2002. The ecological causes and consequences of ant invasions. Annual review of ecology and systematics 33:181-233. Summary: A comprehensive review about invasive ants in general. Human, K. G. and Gordon, D. M. 1996. Exploitation and interference competition between the invasive Argentine ant, Linepithema humile, and native ant species. Oecologia 105: 405-412. Human, K. G. and Gordon, D. M. 1997. Effects of Argentine ants on invertebrate biodiversity in northern California. Conservation Biology 11(5): 1242-1248. Summary: Using pitfall traps, found that Argentine ants displace nearly all native ants and many non-ant arthropods, and cause a shift in arthropod trophic structure. Keller, L., Passera, L. and Suzzoni, J. 1989. Queen execution in the Argentine ant, Iridomyrmex humilis. Physiological Entomology 14: 157-163. Summary: Lab and field work demonstrated that about 90% of mated queens were killed by the workers at the beginning of the reproductive season. Krushelnycky, P. D., Hodges, C. S. N., Medeiros, A. C. and Loope, L. L. 2001. Interaction between the Hawaiian dark-rumped petrel and the Argentine ant in Haleakala National Park, Maui, Hawaii. Studies in Avian Biology 22: 243-246. Summary: Found that Argentine ants do not reduce nesting success of Hawaiian Dark-rumped petrel in Haleakala National Park, most likely because the deep, shaded burrows constructed by the petrels are cold and may discourage heavy ant foraging. Lieberburg, I., Kranz, P. M. and Seip, A. 1975. Bermudian ants revisited: the status and interaction of Pheidole megacephala and Iridomyrmex humilis. Ecology 56: 473�478. Majer, J. D. 1994. Spread of Argentine ants (Linepithema humile), with special reference to Western Australia. In Williams D. F. (ed.) Exotic ants: Biology, impact and control of introduced species: 163-173. Summary: Provides information on distribution of Argentine ants in Western Australia, and potential abiotic requirements. Markin, G. P. 1968. Nest relationship of the Argentine ant, Iridomyrmex humilis (Hymenoptera: Formicidae). Journal of the Kansas Entomological Society 41(4): 511-516. Markin, G. P. 1970. The seasonal life cycle of the Argentine ant, Iridomyrmex humilis (Hymenoptera: Formicidae), in southern California. Annals of the Entomological Society of America 63(5): 1238-1243. Rizo, J. L. F. 1995. Reflexiones sobre las hormigas vagabundas de Cuba. Cocuyo 3: 11-22. Robertson, H. G. Argentine ant bibliography. Summary: A great summary bibliography of Argentine ant research sorted by topic, found on the South African Museum webpage. Suarez, A. V., Bolger, D. T. and Case, T. J. 1998. Effects of fragmentation and invasion on native ant communities in coastal southern California. Ecology 79(6): 2041-2056. Suarez, A. V., Holway, D. A. and Case, T. J. 2001. Patterns of spread in biological invasions dominated by long-distance jump dispersal: Insights from Argentine ants. Proceedings of the National Academy of Sciences 98(3): 1095-1100. Summary: A useful resource reviewing and summarizing Argentine ant colonizations worldwide, as well as a finer scale analysis of spread throughout the U.S. and local expansion rates. Suarez, A. V., Richmond, J. Q. and Case, T. J. 2000. Prey selection in horned lizards following the invasion of Argentine ants in southern California. Ecological Applications 10(3): 711-725. Summary: Found that exclusion of native ants by Argentine ants led to a diet shift in coastal horned lizards, and densities of juvenile lizards were low in Argentine ant invaded areas. Tsutsui, N. D. and T. J. Case. 2001. Population genetics and colony structure of the Argentine ant (Linepithema humile) in its native and introduced ranges. Evolution 55:976-985. Summary: The social structure and genetics of Argentine ants in their native and introduced ranges. Tsutsui, N. D., A. V. Suarez, D. A. Holway and T. J. Case. 2000. Reduced genetic variation and the success of an invasive species. Proceedings of the national academy of sciences, USA 97:5948-5953. Tsutsui, N. D., A. V. Suarez, D. A. Holway, and T. J. Case. 2001. Relationships among native and introduced populations of the Argentine ant, Linepithema humile and the source of introduced populations. Molecular ecology 10:2151-2161. Summary: Using genetic tools to identify the source of invasive Argentine ant populations. Visser, D., Wright, M. G. and Giliomee, J. H. 1996. The effect of the Argentine ant, Linepithema humile (Mayr) (Hymenoptera: Formicidae), on flower-visiting insects of Protea nitida Mill. (Proteaceae). African Entomology 4(2): 285-287. Ward, P. S. 1987. Distribution of the introduced Argentine ant (Iridomyrmex humilis) in natural habitats of the Lower Sacramento Valley and its effects on the indigenous ant fauna. Hilgardia 55(2): 1-16. Wilson, E. O. 1951. Variation and adaptation in the imported fire ant. Evolution 5: 68-79.